Raaga.com: Dhanush’s VISAARNAI becomes FIRST TAMIL MOVIE to compete in Venice International Film Festival in 72 years! Dhanush’s VISAARNAI becomes FIRST TAMIL MOVIE to compete in Venice International Film Festival in 72 years! South film sensation Dhanush is all set to take Tamil film industry to International heights thanks to the selection and the quality of films he is producing under his home production Wunderbar Films. After winning National Award and standing ovations across the World, from the prestigious Toronto Film Festival to the Dubai International Film Festival, for his earlier film Tamil film KAAKA MUTTAI, Dhanush has added another feather in his cap. This time its Dhanush’s second Tamil film VISAARNAI, that is winning rave accolades around the globe. According to reports VISAARNAI has went a step ahead of KAAKA MUTTAI because the film has been selected for the prestigious upcoming 72nd Venice International Film Festival. 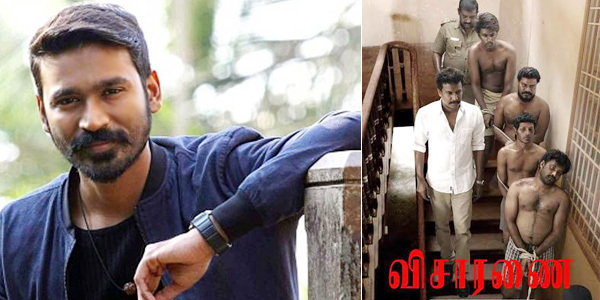 National award winning director Vetrimaaran, elated at the honor said, “I am highly enthralled because out of 1800 to 2500 films, only fifty films are shortlisted for the prestigious competition. Hence I am very happy that VISARANAI features in the list. It is a great feat for a Tamil film and I am quite happy about it”. “The festival is from 2nd to 12th September and they will give us three screenings in that,” he concluded.